Our retreat master told us to go out and view the beauty that God has provided us. The birds, the mighty oaks, the flowers and, yes, even the insects which help us in their own way.It was the first day of retreat at Manresa last week. Anyone knowing about the beauty of that place would imagine the assignment was not all that difficult to fulfill. So off I went, camera in hand to record and show you what God has created Mother Nature to accomplish. 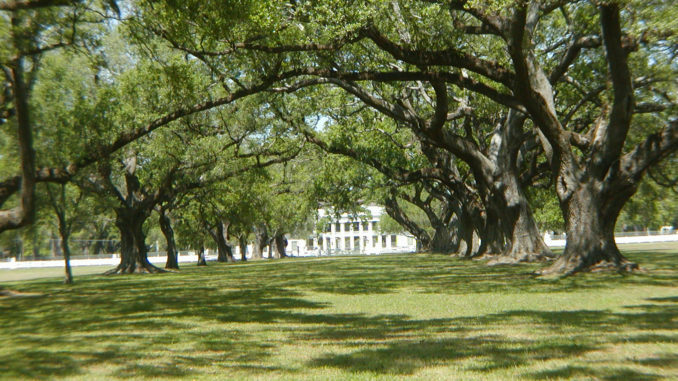 First, a walk beneath the Oak Alley of the Holy Cross to the river. It is one of several oak and cypress alleys at Manresa. Walk up the levee and see the mighty river where navigation has done so much to provide the needs of mankind. Then, a walk behind the building into the woods that nurture animals with food and shelter. So imagine you are on retreat at Manresa and the morning’s first spiritual exercise is over. You are on your own to walk about and gaze at the many wonders Mother Nature has provided. You are at one of the most beautiful places in Louisiana – – maybe the world.